As thrilling as the design and construction of buildings are for architects, the life their creations take on when they start to be used for their intended purpose is even more interesting. Before occupation, though, there is an important intermediate step, known as commissioning. This is when all of the systems, mechanical and otherwise, are tested, balanced and tweaked as necessary to ensure they perform as planned. Specific to performing arts venues, of which we have designed several, this process includes what is known as a tuning phase; a unique effort led by the project’s acoustician with key assistance from a large group of design team members, stakeholders and users. While we work in tandem with the acoustician from the start of the design process to ensure every form within the hall is functional, tuning is meant to acoustically commission the room so that the various types of performances held within the venue sound impeccable. This is most important with non-amplified music, where the right blend of resonance, richness, liveliness and clarity of sound are critical. The performance hall is often thought of as another musical instrument in this sense, and much like the strings of a violin, there are many components that need to be carefully tuned so that, together, they sound just right, before the performance begins. A current example is the Gaillard Center, our project in Charleston, South Carolina, which is nearing completion. The 1,800-seat performance hall has begun the dedicated tuning phase, being led by Akustiks, the acoustical design consultant for the project with whom we have collaborated successfully on a number of projects. What follows here is a simplified explanation of the tuning process. One of the major determinants of a performance hall’s acoustical quality is its PNC rating, which stands for Preferred Noise Criterion. This is a measure of how quiet a hall is, or rather, how good of a job it does at keeping out unwanted noise. Listening to the hall, then, is just that: sitting in the hall with all of the mechanical, theatrical and other building systems operational to assess what, if any, unwanted noise can be heard. This is also the first chance to test the functional effectiveness of the design as it relates to noise mitigation of air handlers, elevators, light dimming systems and so forth. 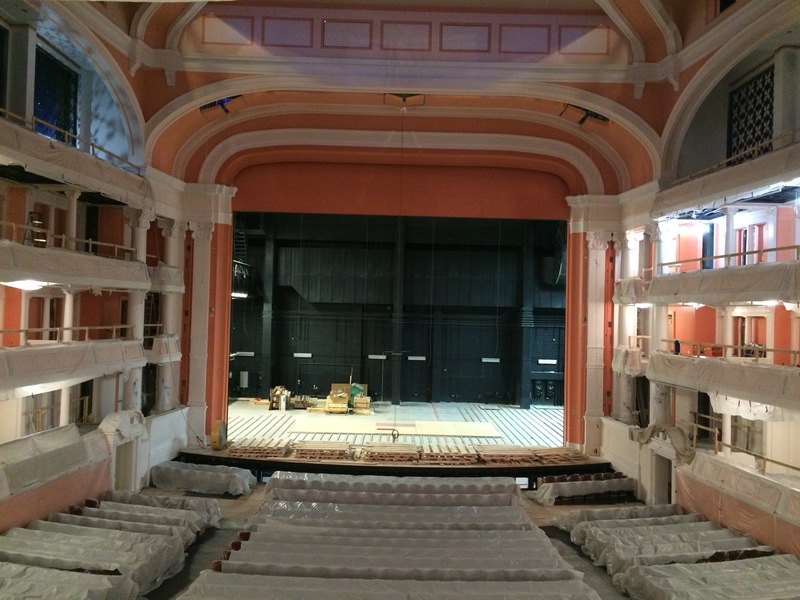 The main performance hall at the Gaillard Center, shortly after seat installation. The acoustician will then schedule different types of events or musical programs covering various genres to assess the quality of sound in the hall. Chief among these is a series of tuning rehearsals with the primary group of musicians who will be using the hall. 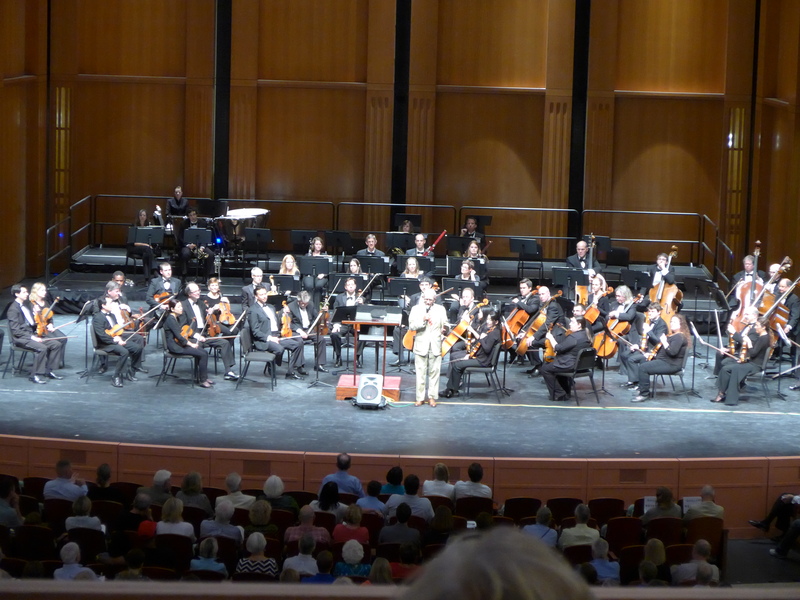 In the case of the Gaillard Center, the Charleston Symphony Orchestra is that group. While a great deal of science, artistry and a well-developed knowledge foundation went into the design of the hall, this is the first chance for the acousticians to assess how music truly sounds within the space. They will listen from different seating areas because the sound can, and does, vary from one part of a hall to another. Furthermore, they will listen to different types of music by different sizes of ensembles to make sure the hall performs as needed for each variation. The venue where musicians play has an effect on how they play, as well. During these early rehearsals, musicians need to play different kinds of music in different orchestral seating configurations. Equally important to the acoustical quality of the hall for the audience is the acoustical quality on the stage for the performers themselves. Referred to as cross hearing, it is critical that sound energy distributes itself across the stage so that performers are able to clearly hear both themselves and the other members of their ensemble. Tuning rehearsals are just as much a chance for musicians to tune themselves to their new performance hall as they are a chance for the hall to be tuned to the musicians. A good example of this that comes to mind is from the first rehearsal at our Schermerhorn Symphony Center in Nashville. I remember very distinctly the trumpets sounding much louder and out of balance with the rest of the orchestra than they should have. When chatting about it with the acoustician, we learned that they were simply used to playing louder in their old venue because the acoustics of that space necessitated it, in order for them to be heard properly. 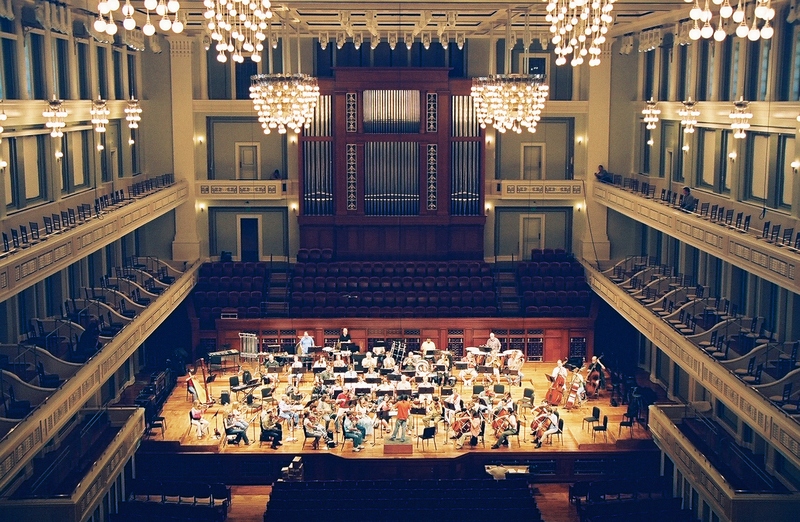 Early tuning exercise at Schermerhorn Symphony Center. The whole tuning effort culminates in what is known as a hard hat concert. This happens at the end of construction, often before the building is formally allowed to be occupied, hence the name. While I am not aware of any hard hat concerts where the audience was required to wear construction safety gear, it is the first opportunity for the acoustician to hear music in the room with an audience present. This is important, because an audience actually absorbs sound, so their presence has a noticeable impact on acoustics. The hard hat concert is aptly named because it is an opportunity for all who worked on the building of a hall – from the designers, contractors, subcontractors and suppliers – to see, but more importantly to hear, the fruits of their labors. It is a way for the owner and contractor to say thank you to all of the men and women who worked on the project by giving them a seat at the first true performance in the building and to be the audience that the acoustician needs for the tuning effort. The Honorable Joseph Riley, Mayor of Charleston, SC, speaks prior to the start of the hard hat concert at the Gaillard Center. So, now that the testing and assessment phases of tuning are complete, what happens next? The acoustician spends time studying all of the measurements, data and impressions collected by them and others from the various rehearsals and concerts. Then, any proposed tweaks or adjustments to the hall and systems determined to be necessary are shared with the team and a program of implementation is developed. Tweaks often include adjustments to the positions, configurations, angles and play heights of orchestra shell components. Additionally, minor changes are sometimes required for some of a hall’s absorptive & reflective elements, to refine the acoustic properties, or mechanical, electrical & theatrical systems, to mitigate unwanted noise. The tuning phase is quite involved, but critical to the success of any performing arts venue. Because it is such an important part of the process of realizing a first rate performance hall, time for tuning is built into the project schedule from the very beginning. A great deal of time is needed to schedule all of the steps described here; however, taking a requisite one to two months of time to ensure a hall sounds great is a mere trifle in the larger scheme of things. From left to right, Associate Steve Knight, Associate Jon Toonkel, Principal Craig Williams. 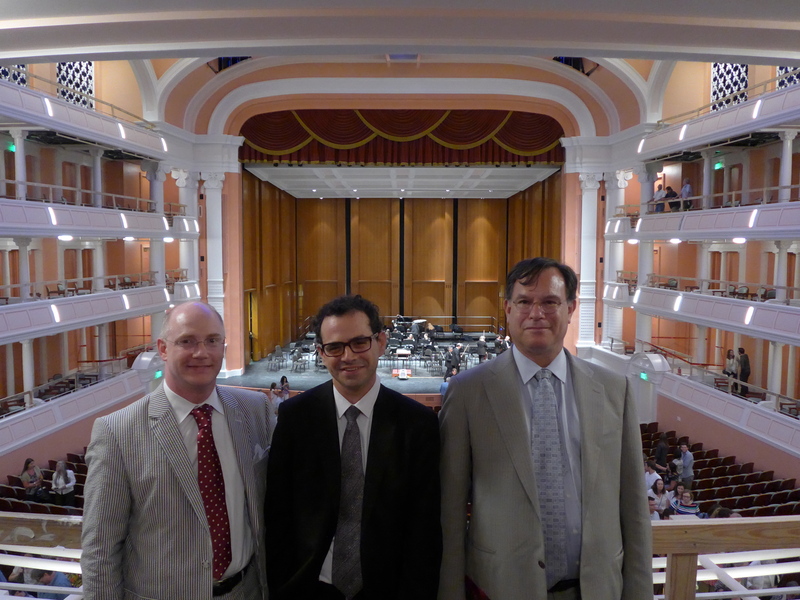 All three worked on the design of the Gaillard Center. The preceding was written by DMSAS Associate Steve Knight. Steve served as Project Manager for the design and construction of the renovation & addition to the Gaillard Center in Charleston, SC. Steve has been with the firm for 18 years and has served on most of the performing arts project teams.